This article is a short summary of Animal Crossing: Happy Home Designer. 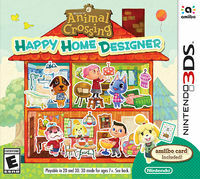 Animal Crossing: Happy Home Designer is a creativity-based game for Nintendo 3DS and a spin-off Animal Crossing game, having players designing houses for the animals rather then living life in a village. The game will launch alongside a series of amiibo cards, of which one is included with each retail copy of the game. Individual copies of the game are also sold alongside a bundle containing the also-launched Nintendo 3DS NFC Reader/Writer peripheral. Nook's Homes Is Now Hiring! Take requests, and create houses for your favorite Animal Crossing characters! Choose from thousands of items to create your client's ideal living space. Design dream homes–inside and out! Transform downtown with shops, a hospital, and even a school. Design a custom home for the animal on the card. Invite characters to the game, assign them roles in town, and save their home designs! Players work for Nook's Homes, building and decorating homes for the animal villagers coming in that are fitting to their tastes. Players are not only able to decorate the interior of each house but also the exterior as well as being able to choose where the house will be built. Rather than the bottom screen being an inventory, it is instead given the function of being a floor plan. Players can select from a vast catalog of items for decorating, which unlocks new items over time. By scanning amiibo cards, players can build a home for the animal on that card, as well as inviting animals to view another's home. Animal Crossing: Happy Home Designer on Wikipedia. This page was last edited on 31 March 2016, at 03:52.